do not forget to include the "math.h"
The Kvalue range is from 1 to 22, the Kvalue is used as index into the source text line. 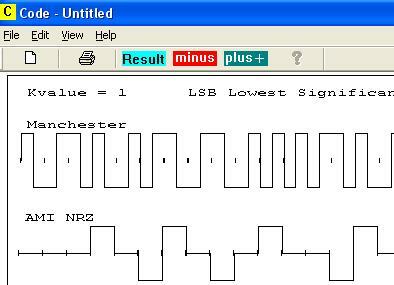 In this example we use the signal from RS232 as source for the modulation. 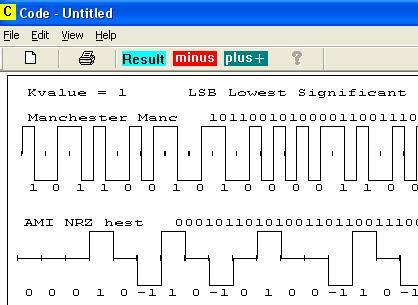 LSB (lowest significant bit) first and MSB (most significant bit) last. with Start- and Stopbit 0100000101. This ASK sends the carrier with logic input ONE and no carrier with logic input ZERO. and a low frequency for logic input ONE. 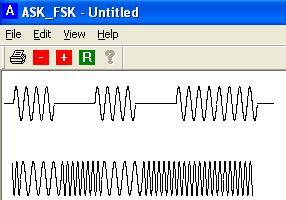 This type of modulation can be generated with a PLL (Phase Locked Loop) circuit. To demodulate the signal we can also use a PLL with a modified circuit. This example demonstrates the theory of UMTS code generation. In this manner we create the chips. Every chip contains the information of one bit of four ASCII bytes. pulse train for the power stage a bridge with six Mosfets or IGBTs. to calculate the sine function we need to include the "math.h"